Aaron Neville’s voice is the real thing. He is now over 70 years old and he sounds fantastic. Having several of his CDs in my collection, it was with heightened interest that I approached this one given the publicity that he was revisiting songs from his own childhood. If you are interested in some fantastic new versions of doo-wop music, then this album will bring you hours of pleasure. To make it even more interesting is the background to this CD. Aaron Neville had to move from his home town of New Orleans following the Katrina hurricane disasters. His home is now New York. Here he has teamed up with Don Was and with Keith Richards as producers and brought in a host of other talents to put together these 12 songs. Actually they went in to make 12 and came out with 23. They all said they had heaps of fun. So stand by for part two. These are not simple copies of the originals. 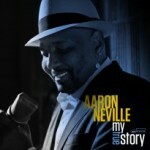 Aaron Neville is at his best in providing his own treatment of these well-known songs. There are tinges of blues and early Rock and roll and doo-wop. This is yet another recommended Aaron Neville album. There’s a PBS video with some previews of the songs from the album.